Archives : DAMP SQUIB - 06/07/2009. The market expected a blockbuster budget after a stunning victory of the UPA government in the election. But the market was disappointed as the budget turned out to be a damp squib. The market had every reason to expect the heavens from the FM, but it got a raw deal from the FM. The budget turned out to be a sort of non event as none of the major announcements were made. The biggest disappointment from the budget was there were no announcements on reforms. The market had already started discounting that there will be several announcements on Decontrol of fuel prices and Disinvestment in several PSU’s, but the FM did not utter anything. The market tanked literally on lack of any positive announcements, but there were two things which were also responsible for the crash seen in the market. The first is the fiscal deficit, which is been seen at 6.8% v/s 6.2% as was announced in the interim budget. The market has not taken this lightly and thus crashed.The next major negative news was hike in Minimum Alternate Tax (MAT) to 15% from 10%. The 50% increase in the MAT is seen as too high for the market to digest and hence the negative reaction by the market. One positive announcement was the abolition of FBT. The Commodity Transaction Tax (CTT) has been abolished as also the surcharge on personal income tax. Another positive was that GST will be introduced by April 2010. Infrastructure got small positives from the budget but not what it had expected. The FM needed to address certain key issues on Disinvestment, Decontrol and FDI, but he chose to keep mum and his silence made the market suffer. It was as if he was playing a politically correct non-controversial budget, but the market wanted the FM to give a clear roadmap and direction on the road ahead. The market dislikes uncertainty and that is what the FM has done. 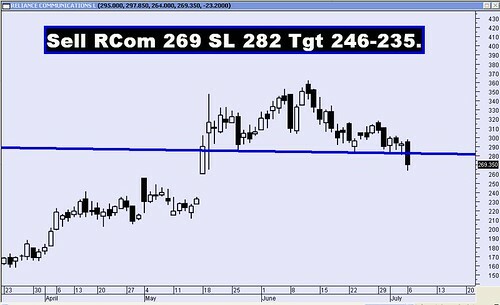 Both Sensex and Nifty reacted nervously and formed a Big Candle on Monday and in the process Sensex has given a Head and Shoulder breakout and Nifty has made a Bearish Diamond reversal pattern. 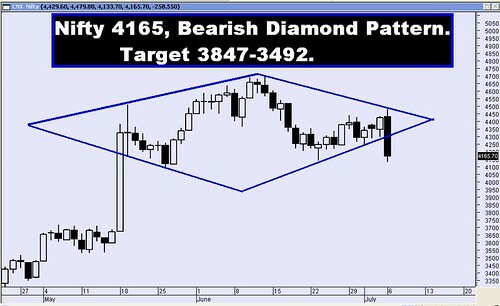 The target according to this pattern formation for Sensex is 13342-12186 and for Nifty target falls at 3847-3492. The Sensex has made an intermittent top at 15600, then it is now correcting this rise from 8047-15600. The correction levels are 12715-11823-10932. Similarly, Nifty has gone up from 2539-4693 and the correction levels are 3870-3616-3362. For the week ahead Sensex has Resistance at 14355-14526-14955. 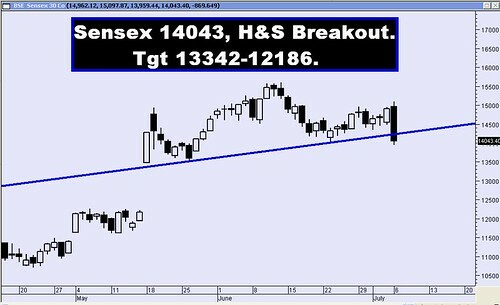 Support at 13790-13518-13252. For the week ahead Nifty has Resistance at 4249-4365-4439. Support at 4092-3847-3616.